Andy Eastwood belongs to the generation of artists who are bringing variety entertainment into the 21st century. Andy's specialities are the ukulele, ukulele-banjo, violin and guitar, and in a high-energy, upbeat stage act, he combines his showmanship and personality with remarkable vocal and instrumental artistry. It's no wonder that Andy has won the acclaim of the public and critics alike, in theatre, cabaret, radio and television. Born in Lancashire to a musical family, Andy entered showbusiness as a child and studied classical violin and piano. But he also developed a passion for jazz and pop and went on to make history at Oxford University by becoming the first musician ever to give a degree recital on the ukulele! He is now described as one of the world's foremost exponents of the instrument. 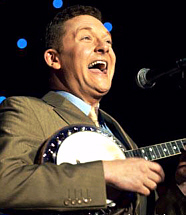 Last year Andy made his 300th guest appearance with The Ken Dodd Happiness Show, and The Stage recently called Andy 'the busiest man in showbusiness' because as well as being a popular name in variety and pantomime, he also makes regular cabaret appearances at top hotels around Britain and aboard cruise ships worldwide. Since 2008 Andy has been presenting Andy's Attic on the internet radio station Retro Jukebox. His most recent television appearances have been two interviews on Cruising With The Stars (Sky 284) and appearances on two of Frank Skinner's BBC documentaries.